2004 Zodiac Pro Open 650,A safe boat to confront the open sea, the Pro Open 650 is approved under the category B design. On board all has been arranged to get the most out of the exceptional characteristics of this &#65533;sportsman&#65533;: an ergonomically comfortable pilot station; room for easy movement on board and maximum storage space. A two-position cooler is installed between the 2 aft lockers, making a spacious bench; placed under the bolster, it leaves the rear of the cockpit free for fishing. Solid and safe in all situations, the Pro Open is considered to be a 4 x 4 of the seasThe Zodiac Pro Open 650 can carry 13, count&#65533;em 13 passengers. It&#65533;s that stable and safe. The 650 makes the most of vital living space and storage areas; the console houses many navigation instruments and dry storage through a watertight door. There is room for skis, diving equipment, and fishing tackle: i.e., whatever you want to bring along. The T-Top provides a great handhold while moving about the boat. Plenty of rocket launchers are available off the T-Top. A T-Top cabin light and remote controlled search light are also mounted on the Top. Self draining deck is a standard feature. Wash down pump is also an option. 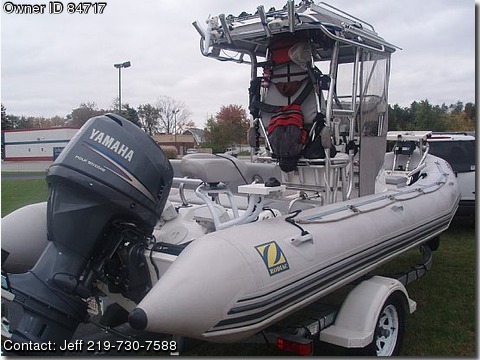 Stainless Steel d rings are located on the transomThe Zodiac Pro Open 650 has 12V DC services. Navigation lights, bilge pump, and electronics are all 12voltDC. Fish finder, Jensen stereo(jack also provided for mp3 player etc) with 10 discs changer(remote pad for easy radio and cd control ), vhf radio(with extension speaker), Gps unit, anchor winch, dual battery charger charging two batteries(batteries replaced this year) L.E.D. battery monitoring display(With warning alarm for low voltage) Cooler livewell with timer aerator and water feed pump. The Zodiac Pro Open 650 is a very capable and accommodating rigid inflatable. She&#65533;ll take you places you wouldn&#65533;t think possible. She&#65533;s economical to run because she is light and requires less horsepower. Complete Sunbrella t top drap encloser, and weather cover. There are two additional fishing swivel seats mounted in the transom area of the boat. There is a seat mount located at the bow of the boat for an additional seat. Abow bait table is also located in front. Cooler space is a plus, one located in the front and also one in the rear. Cushions have been reapolstered this year. Transom has a swimmers boarding ladder.Pro Open tubes are in good shape, some repair patches , all repairs performed by a Professional Zodiac certified repair marina.This boat has been used only in fresh water. Very reliable, and very safe in rough water situations. I've got a lot wrapped up in this boat unfortuneately can't seem to find the time to enjoy it. Email me evrythgsfine@sbcglobal.net, Call 219-730-7588.